Next up in Meatballs of the World is my favorite, the polpette, or Italian meatball. I'm sure that's good and all, but I'm fiercely loyal to my southern Italian family roots. 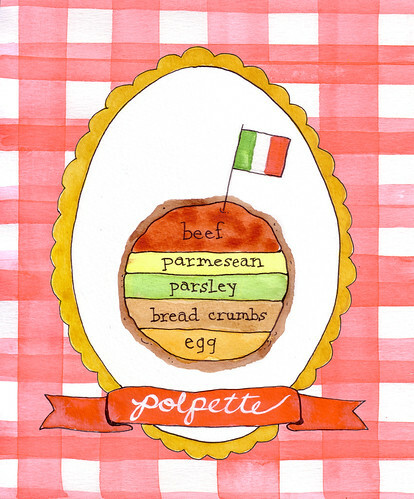 Our family recipe has nothing but ground beef, bread crumbs, parsley, egg, parmesan cheese, and salt and pepper. Simple, yet super flavorful. And I must INSIST that people pan fry their meatballs before plopping them in sauce. Even though some suggest that boiling the meatballs makes them super tender, please believe that there are few things better tasting than a freshly fried meatball, sans sauce. I remember standing next to my grandmother while she fried meatballs, and she would allow me to have one (or maybe two if I was lucky) fried meatballs after they cooled. Now that I make them on my own, I'll admit that my gentleman friend and I eat, like, 10 before shuttling them into the sauce.